When I was packing my hospital bag ahead of the birth of my daughter last summer, I fully intended to be one of those women who gives birth in a full face of makeup and perfect hair so I’d look great in baby’s first photos. Joke was on me. Instead, 36 hours before my (very late) baby was scheduled to be induced, my water broke just after I’d taken off my makeup for the night. I had back labor and then took Stadol that left me more or less out of it for much of my labor (NO REGRETS, FYI — I have never known such pain before or since), and when it finally came time to push nearly 24 hours later, one of the nurses offered to put my hair up in a messy bun for me, and that is how I wore my hair for the next. two. days. because after Below Freezing Baby was born, I had severe postpartum complications and barely had the strength to lift my arms. At least my nails were done. China Glaze Dress Me Up will always be my maternity manicure. Don’t be fooled. IT WAS NOT PRETTY IN REAL LIFE. It took two nurses to get me into that tank top. And thank goodness for the labor and delivery nurse’s hair-putting-up skills, because that messy bun did, in fact, have to hold up for several days. And then we finally got to go home, which was utterly terrifying because we were suddenly responsible for keeping this tiny helpless person alive. All by ourselves. The nice thing about maternity leave is that no one expects you to be remotely put together. But if you’re anything like me, you’ll want to be. I was exhausted like I’ve never been before, and my body felt weird and foreign, and I was catching sleep when I could and trying to be a good hostess to the friends and family members who stopped by to see the baby (and bring food, bless them). I didn’t have the time or the energy to put a lot of work into a makeup routine, but I also needed to be able to look into the mirror and feel confident in the face I saw looking back at me. I wound up settling into a routine that was quick and easy to apply, looked natural, and would last through naps when I could catch them and tears when I needed to shed them. And so, based on my personal experience, here’s the Below Freezing Beauty rundown of maternity leave makeup basics. I’ve provided a high-end and more affordable option for each (with one semi-exception) because it turns out having a baby is expensive — although if you can justify the expense, I strongly, strongly recommend going with the prestige options. Childbirth takes it out of you. If there is one time in your life at which you truly deserve the good stuff, this is it. Usually I’m a full-coverage foundation kind of girl, but pregnancy was incredibly kind to my skin. My go-to foundation in the early days post-baby was Josie Maran Argan Matchmaker Serum Foundation ($42), which I’ve written about before. Warm it up in your hands and blend it in with your fingers. It evens out your skin tone, looks really natural and feels like basically nothing on. For something with more coverage, I’m a fan of Laura Mercier Silk Creme Foundation ($43). Awesome coverage, great finish, lasts all day. 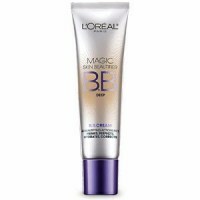 For something more affordable, the L’Oréal Magic Skin Beautifier BB Cream ($10-$13) is a decent alternative to the Josie Maran foundation. Sadly, I haven’t found anything at a lower price point that comes remotely close to Silk Creme. You think you’ve had dark circles? You’ve never had dark circles like you’re about to. Buckle up, sister, and watch your eyes sink deep, deep, deep into your skull as sleep deprivation becomes the new normal. For a high-quality, all-purpose concealer, I love Benefit Boi-ing ($20). Under the eyes, around the nose, corners of the mouth. Boom. You’re set. For a good product at a lower price point, try NYX Full Coverage Concealer in a Jar ($5-$6). Precision is one of exhaustion’s first victims, so I found myself relying on lip products that were fairly forgiving (and, since my body was actively attempting to replenish a whole lot of lost blood, moisturizing). Fresh Sugar Lip Treatment ($22) was perfect — lots of moisture, just enough color, and it feels and smells really nice. For a more affordable alternative, I like Revlon Color Stay Just Bitten Kissable Balm Stain ($9-$12). Long, stupid name for an awesome product. I’m not a huge fan of the unnecessary-feeling packaging that comes with lip crayons, but I do like this product a lot. It’s not quite as nice-feeling as the Fresh lip treatment, but the color is natural and long-lasting. Josie Maran Coconut Watercolor Cheek Gelée ($22) — I’ve written about these before, and I really don’t have enough good things to say about them. They feel great going on, they look incredibly natural, and they’re fun to use. No joke, in those bleary first days, I felt refreshed every time I applied one. I haven’t found anything remotely like the Watercolor Cheek Gelée at a drugstore price point, but if you must compromise on blush, Maybelline Dream Bouncy ($8-$10) isn’t bad. The bouncy texture is fun (and the bar for fun is pretty low when you’re as sleep-deprived as you will be), they blend nicely, and there’s a good range of color options. Before I get into eyeliner, repeat after me: Top lashline only. Top lashline only. Your eyes are going to look small and pinchy — because they’re going to be small and pinchy. Again, sleep deprivation. Lining the inner part of your upper lashline makes your eyes look bigger, and you’ll want something that goes on easily and lasts a long time. Stila Smudge Stick ($20) is perfect. I like black, but it comes in a zillion colors, so go crazy if you like. This is a rare case in which I do think there’s an honest-to-goodness drugstore dupe for the high-end product. Maybelline Eye Studio Master Drama Cream Pencil ($8-$10) made my 2011 favorites because it’s every inch as good as the Smudge Stick — seriously. Have I mentioned that you’re almost certainly going to fall asleep in this makeup? I know it’s taboo. But a lot of the niceties of adult life go out the window for a little while after you give birth. Sad but true. You’ll probably also eat ice cream for dinner more than once during these halcyon days. So pick a mascara that won’t flake off on your cheeks. Urban Decay Supercurl Curling Mascara ($20) is another 2011 favorite. For a good lash at a lower price, you can’t go wrong with Maybelline Volum’ Express The Falsies Mascara ($7-$9), another case of stupid name, great product. OK, here’s the thing: As far as I’m concerned, there is no lower-priced option for setting powder. This is one of those products that you either need or you don’t, and if you need it, you don’t want to cheap out on it. You’re going to fall asleep in this makeup and probably end up rubbing it all over your precious little tiny squirming angel, so invest in the good stuff. And the good stuff is Tarte Smooth Operator Amazonian Clay Finishing Powder ($29). I’ve never used a powder this great. Since I started using it, I no longer have to touch up my foundation or concealer late in the day. S–t does not move. Blotting papers? No need for ’em. Listen, if you have oily or combination skin and you’re reading this list, you can feel good about any of the drugstore products here. But believe me when I tell you: This is the setting powder of your dreams. It is worth every penny. You will not be sorry. So there you have it — your maternity leave makeup essentials. With the exception of the setting powder, nothing on this list has to be applied with a brush. It’s all finger-friendly, it requires zero precision, and you’ll be able to get yourself from haggard to glowing in under three minutes. Which is about as long as you’ll be able to stand up without fainting from exhaustion. Do yourself a favor and get stocked up about a month before you’re due, just in case. Turns out babies come in their own sweet time. One more thing — start getting weekly pedicures in your ninth month. You’ll be surprised how nice it feels to be complimented on your toenail polish while you’re in the middle of trying to push out a baby. Sometimes it’s the little things. Disclosure: Josie Maran products were provided for review by Sephora. Can I still use these products for the same reasons if my kids are 4 and 7? Yes, except you can probably skip the blush. Lugging backpacks and running up and down stairs gives you a natural glow.